The best high school sports town in a state isn't always the biggest city in the state. Case in point is the city of Clovis, Calif. Not even one of the 50 largest cities in the state, the Fresno suburb nevertheless fields some of the best sports teams in the nation and has tremendous fan support. 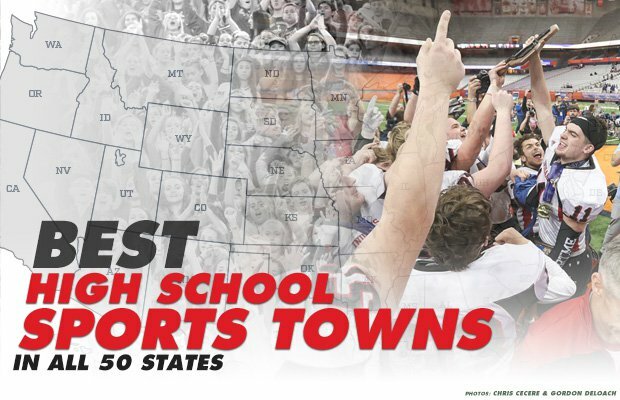 MaxPreps endeavors to recognize the best high school sports towns in each state. Not every town recognized is a small town, nor is every town a metropolis. It's somewhere in between. All towns on this list have one thing in common, however — they all produce some of the top high school sports teams in the state and, in some cases, the nation. Some of the best all-around high school sports programs in Alabama reside in this coastal city. Last fall, McGill-Toolen, UMS-Wright Prep, Mobile Christian and St. Luke's Episcopal were all among the top-ranked teams in their division. During the spring, McGill-Toolen, Mobile Christian and Faith Academy are expected to be among the best in the state. Mobile is also home to the Mississippi-Alabama All-Star football game and has hosted the Senior Bowl, which is a showcase for NFL draft prospects. You can't get much farther north than Barrow, the only U.S. high school located above the Arctic Circle. Despite its remote location, Barrow has produced some outstanding athletic teams, winning state championships in football, basketball, girls basketball and volleyball over the past 10 years. The football field is all turf and games there sometimes need to be halted to chase away stray polar bears. The basketball program was home to Kamaka Hepa, who went on to play at University of Texas. Scottsdale is a baseball town, as it's the spring training home of MLB teams like the San Francisco Giants. It's also home to powerhouse high school baseball programs like Horizon and Notre Dame Prep. However, Scottsdale is also home to one of the best high school football rivalries in the state. Chaparral and Saguaro took a four-year hiatus, but renewed their rivalry last fall. The outing was a 45-37 Saguaro win, but the two teams combined for 1,200 yards of total offense. A one-school town for many years, Bentonville has dominated the Arkansas high school sports landscape for many years. Bentonville won the MaxPreps Cup two years running, 2014 and 2015, recognizing the best all-around sports programs in the nation. Besides being the home of Wal-Mart, Bentonville is also known for its extensive mountain biking trails. Residents of the Central Valley are crazy for their high school sports teams and that's certainly true in the town of Clovis. Located just outside of Fresno, Clovis is home to some of the best high school wrestling in the nation. Clovis, Clovis West and Buchanan have combined for 20 state championships in wrestling with Clovis winning 13 alone. Clovis schools also have a strong history in baseball and football with Buchanan named national champions in 2011 and 2016. Clovis is also host to the CIF state track and field championships. You don't get more traditional than Pueblo, where local teams have forged a rivalry dating back to the 19th century. Football games routinely draw over 10,000 and the annual Bell Game between Pueblo Central and Pueblo Centennial even has its own Wikipedia page. One of the best public schools in Connecticut and one of the wealthiest cities in the nation, Darien also has a tremendous tradition in high school sports. Darien football and lacrosse teams have won multiple state championships, have been nationally ranked and also have put together long win streaks. The town is also home to multiple country clubs, golf courses and beaches. Wilmington is home to the best rivalry in Delaware — St. Mark's vs. Salesianum. Whether it's football, basketball or ice hockey, these two schools draw thousands of fans for their annual battles. The football outing between the two teams regularly draws over 7,000 fans and is dubbed "The Holy War." Florida has a number of great high school sports towns, including Jacksonville, Miami, Tampa Bay and Orlando. But watch out for Oviedo. Both Oviedo and Hagerty, the two public high schools in the town, have won recent boys basketball state championships and regularly challenge for a title each year. Oviedo High is also a rising power in boys and girls swimming and has won multiple state championships in girls volleyball. Niche lists Suwanee as the best place in Georgia for public high schools. Those schools are also very good at high school sports. Lambert has won the Director's Cup in Georgia, given to the school with the best all-around sports program, four years running. It has 26 state titles since 2011. Schools like North Gwinnett, Collins Hill and Peachtree Ridge have all had success in sports and have sent athletes on to the professional level in football, women's basketball and baseball. The largest city in Hawaii, Honolulu also features a couple of the best overall high school sports programs in the country in Punahou and St. Louis. The Buff N' Blue have won over 500 state championships in its history, while St. Louis has won close to 20 state championships in football — the most of any school in the state. A small town on the western border of Idaho, Fruitland is home to groves of apple trees. It's also home to multiple state championships. Two-defending state champions in football, Fruitland also won a boys basketball state championship in 2018. In baseball, Fruitland has won six championships in the past decade. A Chicago suburb, Naperville has grown to become one of the largest cities in Illinois. It also has some of the top athletic programs in the state in Naperville North, Naperville Central and Neuqua Valley, to name a few. Naperville North had the country's No. 1 boys soccer program in fall 2018 and its girls cross country team was ranked No. 2. Its water polo program is also one of the best in the state. Neuqua Valley also has one of the top boys cross country programs in the nation and was one of the top baseball teams in the nation in 2018. 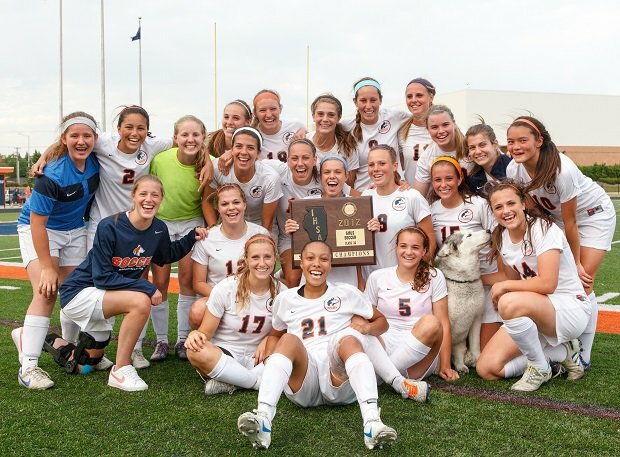 Naperville North (Ill.) celebrates a girls soccer section title in 2012, even having a Husky in the team picture. Carmel has been ranked as the best place to live in the United States by some publications and it also has a reputation as one of the best high school sports towns in the nation. Carmel routinely ranks among the top programs in the MaxPreps Cup and has won 160 state championships since 1970. The girls swimming program alone has the longest state championship winning streak in the nation with 33 in a row. Rivals Iowa City and Iowa City West battle in "The Boot" game every year, marking the football rivalry between the two schools. West has been particularly impressive over the past decade, winning state titles in multiple sports including six in 2012, making it the first school in the state to accomplish the feat. Regina, a smaller school in the city, has been a power in football, winning six state titles in a row during the past decade along with a 56-game win streak. McPherson has dominated multiple sports in Class 5A division over the past decade. The Bullpups have been one of the best all-around athletic programs in the state and have won recent state titles in girls volleyball, boys and girls basketball. Not only is Louisville home to best high school boys sports program, it's also the home to three of the best girls sports programs. St. Xavier was deemed the best boys program in the nation by the MaxPreps Cup last year. The Tigers have won close to 180 state championships in 13 different sports. Meanwhile, Assumption, Mercy and Sacred Heart are routinely ranked among the top volleyball programs in the country (Assumption was No. 1 in the MaxPreps Top 25 for 2018) and also excel in other sports. Not to be forgotten are schools like DuPont Manual and Male, which have one of the great high school rivalries in all of sports and also rank among the all-time winningest football programs in U.S. history. In the northeastern part of the state, West Monroe has been a football powerhouse in Louisiana by posting double figures in wins nearly every year for the past two decades. West Monroe also has won a couple of national championships according to one ranking service. The baseball team has also been productive, posting 38 wins two seasons ago. A small coastal town, Scarborough has become a high school sports powerhouse in the state. In the 2017-18 school year alone, Scarborough finished either first or second in the state in 10 different sports, winning five state titles. Successful in both academics and athletics, Severna Park ranks as one of the best schools in the nation on both counts. The school has been particularly successful in lacrosse, field hockey, swimming and cross country. Wellesley ranks as one of the top cities in the nation when it comes to wealth and education. It also ranks among the best for high school sports. Wellesley is particularly strong in girls sports as it won six state titles last year and ranked No. 8 in the nation among girls sports programs, according to the MaxPreps Cup rankings. The Big Reds of Muskegon have one of the oldest football traditions in the country, dating all the way back to the 19th century. They've won more football games than any school in Michigan and more state titles, actual or mythical, than any other program. 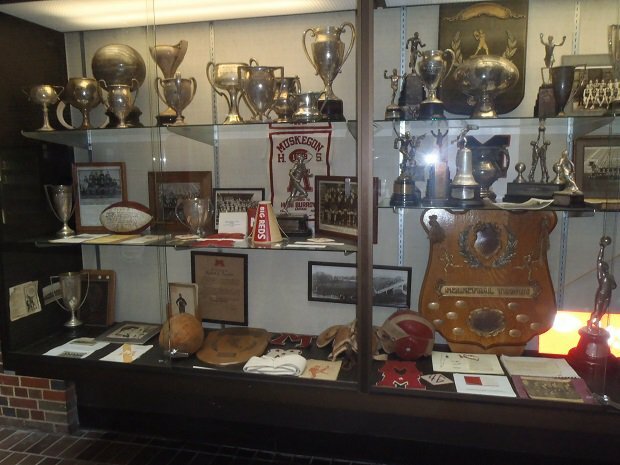 The trophy case at Muskegon is filled with accomplishments from the Big Reds, who have won more football games than any school in Michigan. Besides being the home of the Minnesota Vikings training facility for over three decades, Eden Prairie has been one of the most successful all-around athletic programs in Minnesota. It is particularly strong in football, where Mike Grant, the son of former Viking coach Bud Grant, has guided Eden Prairie to nearly a dozen state championships during his tenure. The home of Ole Miss University, Oxford has been home to some outstanding athletic teams from Oxford and Lafayette high schools. Oxford's football and baseball teams have been among the best in the nation in recent years, while Lafayette's girls soccer and volleyball teams have been among the state's best this year. Webster Groves is home to one of the greatest Thanksgiving football traditions in the nation in its annual battle with Kirkwood. The game ranks as one of the oldest rivalries in the country and generally draws about 12,000 fans every year. Bozeman routinely ranks as one of the best academic institutions in the country, but it also has one of the best athletic programs. Last year alone, Bozeman was winner or runner-up in 11 state championships contests last year, finishing No. 23 in the MaxPreps rankings. Bozeman also has one of the top cross country programs in the nation. The home of the College Baseball World Series, Omaha is also home to many of the perennial powerhouse athletic programs in the state. Creighton Prep is the state's all-time leader in football state titles and has also dominated in swimming in tennis. Meanwhile, Omaha Westside has been dominant in boys swimming, girls tennis and baseball. Skutt Catholic has won 19 state wrestling championships. Located outside of Las Vegas near Hoover Dam, Boulder City has been a Class 3A powerhouse in Nevada, winning three state championships in the fall of 2018 alone. The city also won a national athletic competition on the 1970s television show "Almost Anything Goes," where it competed in athletic events against cities from all over the country. A suburb of Manchester, New Hampshire's largest city, Bedford has proven to be a force in high school sports in the states for well over two decades. The boys tennis team won 110 matches over the past eight years. The boys lacrosse team is one of the best in New England and once won 78 matches in a row. A small town with one high school in suburban Camden, Haddonfield has been a powerhouse at the small school level. It ranked as the No. 2 small school athletic program in the nation last year after winning seven group championships. The school has won over 70 group championships in its history. Las Cruces has one of the best high school football rivalries in the nation in Las Cruces vs. Mayfield. The two teams have combined to win over half of the past 20 large school state football championships in New Mexico. The rivalry game regularly draws over 20,000 fans and even had a movie made about it called "Cruces Divided." During the winter, Glens Falls is host to the high school basketball championships in New York. Glens Falls high school has had successful teams in boys and girls basketball, particularly in recent years with Joe Girard III leading the way. Girard set the all-time scoring record in New York last year and ranks among the top 20 all-time leading scorers in national history. Located near the Research Triangle in the state, Cary is home to the USA Baseball National Training Complex and it annually hosts arguably the best high school baseball tournament in the nation — the National High School Invitational. Cary is also home to Green Hope, a school that has been among the top athletic programs in the nation, according to the MaxPreps Cup, for the past three years. The Bismarck-Century rivalry is a fierce one in all sports, from football to hockey. Between the two schools, they have combined for over 150 state championships and are both regularly among the top schools in the nation in the MaxPreps Cup rankings. Cities like Cleveland and Cincinnati have multiple schools that have winning traditions, but it's hard to overlook the type of tradition that has been established in Massillon, where Washington has won more national championships in football, nine, than any other school in the country. The rivalry with nearby McKinley also ranks as one of the best in the nation. Jackson has also been a basketball power as of late, winning Division I titles in 2010 and 2017. 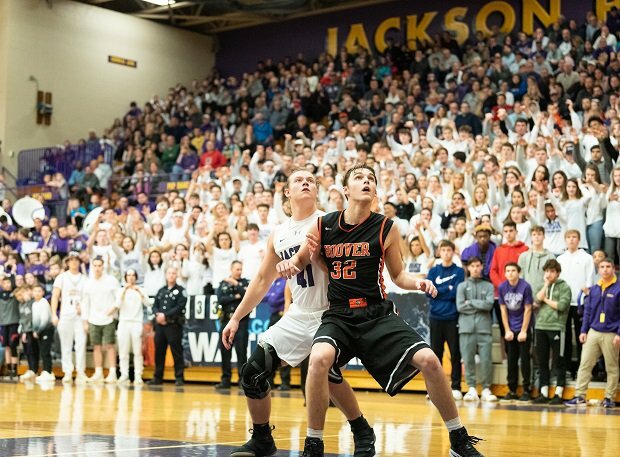 Many think football when it comes to Massillon (Ohio) but the Polar Bears of Jackson have built a boys basketball powerhouse with a pair of recent state titles. Jenks is home to some of the best high school sports teams in the country. While the public high school is best known for the football program (which has won 16 state titles), the overall program has won over 180 state titles combined, excelling in tennis, golf, swimming and cross country. Named the best "multi-sport town" by Outside Online, Bend also has a great reputation when it comes to high school sports. Summit is regularly one of the top all-around athletic programs in the state while Bend claimed a volleyball state championship this past fall. The city of Bend has many outdoor activities including hiking trails, climbing routes and running paths. Wexford is an unincorporated area outside of Pittsburgh that is rapidly establishing itself as one of the top high school sports towns in the country. North Allegheny is the only school in the town and it ranks as one of the top schools in the state for academics. It's the top school in the state for high school sports based on the MaxPreps Cup as it won four state titles in the fall of 2018 alone. Home to Toll Gate, Pilgrim and Bishop Hendricken, Warwick produces some quality high school teams. Bishop Hendricken has been particularly successful in football, where it has played in more state championship games than any other program in the state and also won seven straight state titles. While many cities have a cross-town rivalry, Rock Hill has one of the best three-way rivalries in the country. Rock Hill, South Pointe and Northwestern regularly rank among the best football programs in the country, let alone the state, and have sent numerous NFL players, including members of the Super Bowl champion New England Patriots Stephon Gilmore (South Pointe) and Cordarrelle Patterson (Northwestern). Sioux Falls is home to five of the best all-around sports programs in the state in Lincoln, Roosevelt, O'Gorman, Washington and Sioux Falls Christian. Lincoln has ranked high in the MaxPreps Cup rankings the past few seasons and Roosevelt was 33-0 in baseball two seasons ago. Washington, meanwhile has won over 40 state championships in football — the most of any school in the country. Between Brentwood and Brentwood Academy, the two school schools have combined for over 160 state championships. Add in Ravenwood and the total closes in on 200 total state titles. Austin is home to over 50 high schools, but two specific high schools — Westlake and Lake Travis — make up one of the best rivalries in the state. Both have been strong in baseball over the years with Lake Travis winning multiple football championships under the likes of national high school Player of the Year Garrett Gilbert and Heisman Trophy winner Baker Mayfield. The city is also the largest in the nation without a professional sports franchise, but it does have a number of minor league outfits. The city is also known for hosting marathons and triathlons. Recognized as one of the best places to live in Utah, Kaysville is also home to Davis, one of the top all-around athletic programs in the nation. Davis has won the all-sports award in Utah four times in the past 10 years and has one of the top golf and track and field programs in the state. Although a small town in terms of population, Hinesburg is home to the largest high school in the state in Champlain Valley Union, which actually consists of students from neighboring towns as well as Hinesburg. Nevertheless, Champlain Valley Union has established itself as one of the top athletic programs in the nation and has ranked high on the MaxPreps Cup rankings for several years. Woodgrove and Loudoun Valley are the two high schools in Purcellville, a small town in Northern Virginia. Loudoun Valley has had one of the top basketball programs in the state of Virginia for many years and the boys cross country team was ranked No. 1 in the nation. Both Loudoun Valley and Woodgrove rank among the best all-around programs in the state by the MaxPreps Cup rankings. Spokane has been home to some of the most talented athletes to ever come out of the state of Washington. Ryne Sandberg, Mark Rypien and John Stockton have all called Spokane home. 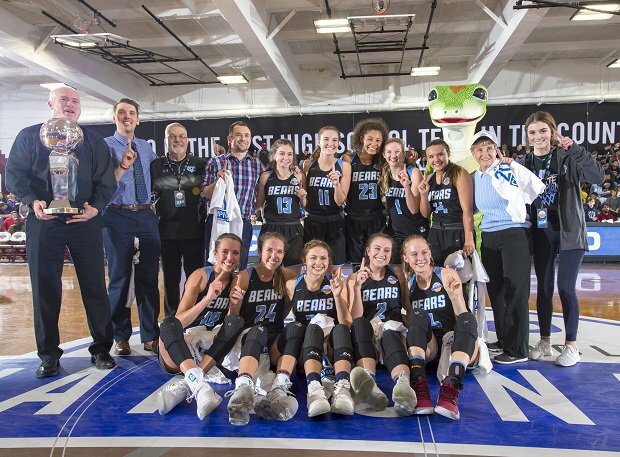 The basketball teams at Ferris, Gonzaga Prep and Central Valley have been among the best in the state with the Central Valley girls winning a national title last year. The cross country teams at Mead, Ferris and University, meanwhile, combined to win 22 straight cross country state championships. One of the oldest schools in the city, Parkersburg has been dubbed "School of Champions" for its many state championships. It has won over 20 state titles in boys tennis and wrestling and its football team is one of the winningest programs in U.S. history with 820 all-time wins. The rivalry between Parkersburg and Parkersburg South ranks as one of the best in the state of West Virginia. Few athletic programs have been as successful as Kimberly has been the past few years. The Papermakers have put together winning programs in baseball and basketball, but they have made national headlines in football, going undefeated for five years in a row. Casper is home of one of the best rivalries in the state between Kelly Walsh and Natrona County. The two teams have played in the "Oil Bowl" for the past 53 years. The two high schools also have two of the best overall sports programs in the state. The two teams accounted for five state titles combined this past fall. Spokane Valley's Central Valley girls basketball team won not only the Washington state title, but was also named the MaxPreps National Champion in 2018.